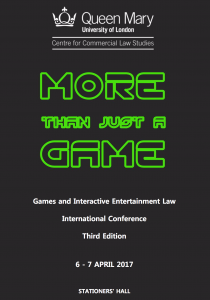 Again this past April I was honoured to participate in my wonderful colleague, Professor Gaetano Dimita’s outstanding annual international “More Than Just a Game” conference, in London, U.K. The conference was fittingly put on at historic Stationers’ Hall by the Centre for Commercial Law Studies, Queen Mary University of London, aided and abetted by a group of excellent and generous sponsors. 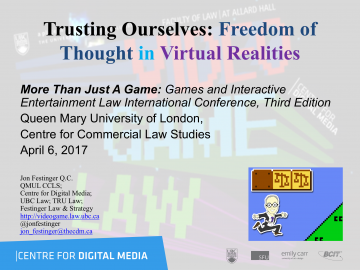 My talk focussed on when and how the law could intervene when virtual reality becomes so convincing that our freedom of thought becomes compromised. The presentation was based on the last two 2017 lectures of this course, and for that I am indebted to class for your indulgence and very helpful suggestions and questions. Above is a video of my talk, then the slides related to it and finally a link to video of all of the panels at the conference. Here’s to the 2018 edition of “More Than Just a Game”, and to many more thereafter….